Adding more to the paper. Why not post it here. Once Upon a Time. 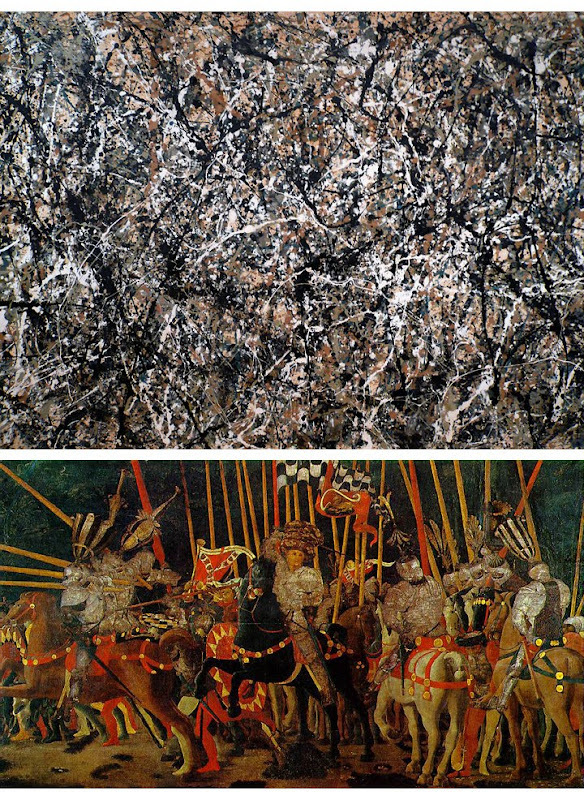 When I first came across the lines by the duke of Aquitaine some years ago, naturally I imagined them in Jackson Pollock’s mouth. They put me in mind of modernism; or of one moment of modernism which I realized I had been trying (and failing) to get in focus ever since I had read Harmonium or looked at Le Bonheur de vivre. Two things were clarified. Not just that modern artists often turned away from the detail of the world in order to revel in the work of art's "essential gaudiness," but that the turning away was very often associated with a class attitude or style not unlike Duke William's, or, at least, an attempt to mimic that style - its coldness, brightness. lordliness, and nonchalance. Its "balance, largeness, precision, enlightenment, contempt for nature in all its particularity."' Its pessimism of strength. You might expect such an effort at aristocratic world-weariness on the part of bourgeois and even petty-bourgeois artists, operating in the nineteenth and twentieth centuries not the eleventh and twelfth, to bear some strange fruit. Largeness and lordliness, after all, were not likely to be these artists' forte. Take the novelist Gustave Flaubert, for (central) example, at the beginning of work on Madame Bovary in 1852: already chafing at the he bit of reference that seemed to come with the form he had chosen and dreaming of "a book a about nothing, a book dependent on nothing external, which would he held together by the internal strength of its style ... a book which would have almost no subject or at least where the subject would be almost invisible, if such a thing is possible.” What strikes me as truly strange in Flaubert's case is not so much the project he outlined for himself - though as an ambition for a novel rather than a sestina or a set of haiku it has its own pathos – as the distance between the book he imagined and the one he actually wrote. No book has ever been fuller than Madame Bovary of the everything external which is the bourgeois world. Fuller in its heart of hearts, I mean; fuller in its substance; in the weight it gives to words themselves. It is as if the more intense a bourgeois artist's wish to dispense with externals and visibilities, the stronger will be their hold an the work's pace, structure, and sense of its own objectivity. Or maybe we could say that what brings on the word "bourgeois" at all as a proper description of Madame Bovary is exactly the deadlock within it between a language so fine and cold that it hopes to annihilate the emotions it describes as it describes them, and an absolute subjugation to those emotions and the world of longing they conjure up. A deep sentimentality, not relieved but exacerbated by a further (ultimate) sentimentality about language – call it belief in the arbitrariness of the sign. See also earlier posts: on Clark (Cafe Concerts), Eliot, Greenberg's snobbery (and cultural insecurity) and Marie Lloyd. All now plugged into the paper. The artist as preacher, side show barker, and snake oil salesman. The Confidence Man. And women open your purses!"